Tips and solutions for NOKIA LUMIA 525 problems. Nokia Lumia is the smartphone brand from Nokia which have Microsoft Windows Phone operating system. If you ever know about the fantastic product from Nokia Lumia 520, then NOKIA LUMIA 525 is the successor with almost same specifications but improve in memory RAM as know NOKIA LUMIA 525 have 1GB RAM for doing more job with multitasking applications. What to do to Fix Problem or Recovery NOKIA LUMIA 525 hang or not responding or malfunctions or stuck or freezing or bricked ? There is not many improvement between previously Nokia Lumia 520 vs NOKIA LUMIA 525, the main improvement is at NOKIA LUMIA 525 1GB RAM. Microsoft Windows Phone seriously take good advantage for 512MB RAM, by using more RAM as 1GB will make the ability of NOKIA LUMIA 525 will increase to run more applications together or multitasking. Therefor, some user have bad experience using NOKIA LUMIA 525 which have problem like hang or stuck or bricks or frozen or LCD touch screen not responding when doing some applications. When we get this problem, we need to do soft reset or restart or reboot to make it start from beginning then remove some temporary files and cache. If the problem can not solved, then we need to do hard reset to clean all error from applications which make the functions of NOKIA LUMIA 525 not working well. How to Soft Reset or Reboot or Restart NOKIA LUMIA 525 ? Do not panic when our NOKIA LUMIA 525 stuck in some applications and the lcd touch screen can not response for our finger touch, we can force restart or reboot or soft reset easily by open the back cover, and unplug the battery to remove from NOKIA LUMIA 525 body. Please wait about 5 seconds, after that we can put the battery again in the right positions for NOKIA LUMIA 525, continue with Press POWER BUTTON to turn it on again. Other step to force shutdown or force off NOKIA LUMIA 525 without opening the battery by press and hold POWER BUTTON for several second until the phone shutdown by itself, if you see ‘slide down to power of‘, do slide the phone then it will turn off. We need to press Power button again to turn on NOKIA LUMIA 525 on again. How to Master Reset NOKIA LUMIA 525 to Factory Default ? The NOKIA LUMIA 525 will do the hard reset format, wait about three until five minutes. While waiting you will see the gear appear until it finish. How to Restore and Reinstall Clean Windows Phone 8 operating system / firmware at NOKIA LUMIA 525 ? The file source of clean factory default Microsoft Windows Black already saved inside NOKIA LUMIA 525 ROM, so we do not need to connect anything when we want to reinstall or restore the clean and factory default setting Windows Phone operating system at NOKIA LUMIA 525. When we should doing reinstall Windows Phone ? This is depend on how bad or how damage the NOKIA LUMIA 525 operating system. Some applications could make our NOKIA LUMIA 525 operating system become corrupt or running not smooth, or problem at sound system, or camera can not capture good picture or something like that. Doing reinstall or restore the operating system or firmware is similar step with doing hard reset or master format with above step. Please remember to backup all important data before doing reinstall, because all important data can be deleted or wipe from NOKIA LUMIA 525. How to Unlock or Fix or Bypass or Solutions for NOKIA LUMIA 525 forgot password code or security lock screen pattern or pin (lost password)? We always suggest user to always give more security protections for our NOKIA LUMIA 525, giving password pin is recommended. The problem happen when we forget about security answer. Until now we still do not have alternative step to bypass NOKIA LUMIA 525 security protections, the only step that we can do when forgotten our security password protection have to reinstall or hard reset the NOKIA LUMIA 525. How to Improve Performance NOKIA LUMIA 525 to make run more faster? Always install important applications for our NOKIA LUMIA 525, the user should aware that doing install many application can make NOKIA LUMIA 525 will suffer hard work, especially if the applications run in the background together. This problem could make NOKIA LUMIA 525 run slowly and sometime battery also faster to drain. If we need to make our NOKIA LUMIA 525 run faster then we need to reduce the installed applications especially who run in the background. If we need to make the performance of NOKIA LUMIA 525 run faster again like new, then we should consider to do hard reset or reinstall the operating system. What is the Secret Code Key for Hard Reset NOKIA LUMIA 525 ? There is no secret code for doing hard reset or master format NOKIA LUMIA 525. Just follow the step above to hard reset is the easy way to do. [Q] There is something wrong with my Nokia Lumia 525 display. Lockscreen appears but after unlocking by code, NOTHING on the display. What should I do? [A] Hi, if you can not do anything. Then we suggest to do hard reset to reformat your Nokia Lumia 525 operating system to factory default. Please follow steps at #option 2 above carefully. [A] Hi, usually after finish hard reset, your Nokia Lumia 525 will reformat the operating system to factory default. It will act like new, including without no airplane mode. However, please make sure you have do hard reset or reformat to factory default process. Otherwise, you may discuss with Nokia authorize service center for further help. The information from this page describe about lumia 525 hard reset,How to reset lumia 525,how to hard reset lumia 525,how to format lumia 525,how to reset nokia lumia 525,how to format lumia 535,nokia lumia 525 hard reset,how to hard reset nokia lumia 525,nokia 525 hard reset,how to reboot lumia 525. If you need another resource for hard reset, use search function at this homepage or find from our related posts. How to Easily Master Format SAMSUNG GALAXY J7 PRIME with Safety Hard Reset? How to Easily Master Format XIAOMI REDMI NOTE / REDMI NOTE 4G / HONGMI NOTE with Safety Hard Reset? Hi, if you can not disable flight mode at Nokia Lumia 512, then maybe your Windows Phone OS get trouble and need to reformat or reinstall using factory default operating system, please consider to reformat it using menu setting above because your Nokia Lumia 512 still can boot properly. i forgot my Nokia Lumia 525 Screen lock Password, help. Hi, unfortunately you can not bypass or unlock forgotten security protections at Nokia Lumia 525. The only steps that you can do is doing hard reset or reformat your Nokia Lumia 525 using hardware button combination key like steps at #option 2 above. Hi, you can do hard reset steps like #option 1 to reformat your Nokia Lumia 525 when your phone still can boot properly. Otherwise, you have to do hard reset using hardware button combination key like steps at #option 2 above. Hi, the reformat steps for your Nokia Lumia 525 when it can not boot is using hardware button combination key like steps at #option 2 above. Please follow steps by steps carefully start with BIG STEP A until BIG STEP B. If you can not reformat it, maybe your sequences are not correct. Please try again several time. If you still get some trouble with reformatting, then please consult with nearest Nokia authorize service center. "ERROR: Unable to find a bootable option. Press any key to shut down." Hi, please try to follow steps at #option 2 above. Start from BIG STEP A and start with your Nokia Lumia 525 power off. I have the same problem showing ERR rebooting problem.I have tried to hard reset but no exclamatory sign coming. Not getting off. I stared by removing battery to make it off. First when I pressed strt button it vibrated I released it started showing NOKIA as like it is starting.it. When pressed volume down it shows rebooting problem. It get off till I remove battery. Hi, unfortunately we do not have good answer for rooting problems, because there are many non standard possibilities happen. If you still get the problems, then we suggest to bring your Nokia Lumia 525 to Nokia authorized service center. 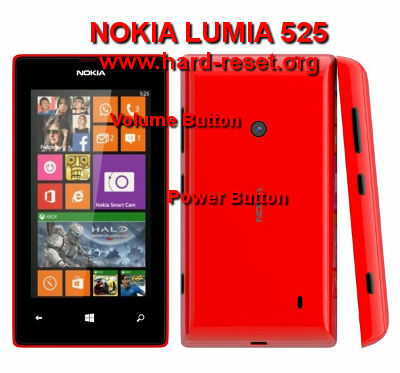 Hi, if you can not unlock your Nokia Lumia 525 with known password, then you have to do hard reset to restore your Nokia 525 operating system to factory default without lock protection. Please follow steps at #option 2 above carefully to reformat using hardware button combination key. Hi, usually after finish hard reset, your Nokia Lumia 525 will reformat the operating system to factory default. It will act like new, including without no airplane mode. However, please make sure you have do hard reset or reformat to factory default process. Otherwise, you may discuss with Nokia authorize service center for further help. There is something wrong with my Nokia Lumia 525 display. Lockscreen appears but after unlocking by code, NOTHING on the display. What should I do? Hi, if you can not do anything. Then we suggest to do hard reset to reformat your Nokia Lumia 525 operating system to factory default. Please follow steps at #option 2 above carefully.